Monday after we were done hanging out the laundry we took time out of our busy schedule to watch the solar eclipse. We didn’t have any special glasses but held three pair of dark sunglasses together to see the moon pass in front of the sun. It was amazing to see! Only God can arrange how such a wonderful universe works. It didn’t get too dark in our area but it almost looked like it was evening after the sun starts going down. It was worth it to let our work set for awhile as we watched. It seemed like the day was extra hot and humid. Then the rain we had during the night cooled everything off. Now we are having chilly mornings. The temperature showed forty-seven degrees this morning. 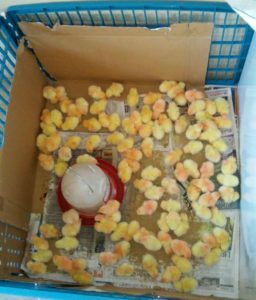 Yesterday our order for one-hundred broiler chicks came. These are butchering chickens for meat. Fifty are for us and fifty for Mose and Susan. It will be good to have chicken in the freezer to use. With our chilly mornings the chicks need a heat lamp yet to keep them warm. They are very active and can make quite a bit of noise. Tuesday daughter Elizabeth and Abigail came to help us. Also sister Emma and son Jacob. Jacob is almost eighteen and has muscular dystrophy like some of our children do. He keeps busy making a lot of different things from wood. He carves out names or makes Aggravation board games, shelves, picture frames, and a variety of things. A lot was accomplished Tuesday. The back entrance to our home was cleaned from top to bottom—windows, doors, etc. Also forty-eight quarts of tomato juice were canned. The next tomatoes we get will probably be put into salsa for daughter Susan. We have more sweet corn that is almost ready. We planted three different times so it’s not all ready at once. On Tuesday Kevin had his first day of school. It sure was different to see him be the only one getting on the bus. Today we will get the rest of Lovina’s seventh grade books for homeschooling. Last Saturday, daughter Elizabeth and Timothy and little Abigail helped here all day, getting ready for the church services. Also sisters Verena and Susan. As if we didn’t have enough to do, our two bushels of peaches were ready to be canned and frozen. I always freeze a lot in small containers to put in lunches. It’s like a small ice pack for the other food in the lunch bag and will be thawed and ready to eat by lunch time. Today, Thursday, a few of the girls and I will go get groceries for our church lunch on Sunday. I used to think it was a big task to go shopping for church groceries. After two weddings in our family the last two years, this seems like nothing. Tomorrow we will do laundry, mop the basement floor and clean a few more windows down there. That should wrap up the cleaning for church. Our gas stove and propane-run refrigerator need a good cleaning. I am hoping to do that after I get home from getting groceries. Son-in-law Mose has been getting the garden weeds under control and tilling up the ground that is done for the season. Mose’s sister Esther will be baptized on Saturday. (Sometimes a baptismal service is held on a Saturday if too many other church districts also have someone following instructions for baptism.) So Mose and Susan will go to his parents’ house where the baptismal church services will be held. This will make two days of going to church for them. I will share my recipe for frozen peaches. God bless you! Previous PostAbigail acting her age, plus other tales from the Eicher familyNext PostWhy work so hard cleaning for church services? Thanks for sharing your frozen peaches recipe, Lovina. I never thought to use orange juice concentrate…I like this idea…I am sure it is wonderful. Especially, opening a container in the winter.